I really like this illustration-the detail on his face is amazing. What a great list of things to be thankful for:)Happy Thanksgiving! Terrific illustration. Can't wait to see it when it's finished. But I'm glad you are keeping so busy. Amazing!! Where is his corn on the cob sword? Great work, Sam. Love the list-- these are the types of things that most people take for granted. It's as if you took Sam Nielson, Adam Ford, and Ryan Wood and mixed them all together! You gotta finish it now Sam! It is really really cool! It reminds me of your Mike Mignolia piece. And is El Fro talking about our physique's? that is friggin awesome Sam! Good job on MerMan, I dig the dopey look on his face. Bravo, Sam! I'm thinking you might be a little bit TOO amazing. Thanks for the inspiring work! About those comments regarding the British "Office"...? Guil'y as charged. But it is better ;) Oh, and this piece is AMAZING. these are a He -Man´s villain! I love the picture and love the list. I was laughing the whole time I read it. This is so awesome Sam! I really love your painting techniques . . . wish I could take your painting class on Painter . . . I haven't figured out that program? Anyways, really nice work. I N C R E D I B L E !!! I wish you had prints of this available, because it is fantastic. i thought that webster from he-man....! well,,,,? i had that doll "yes doll/s"
Before, collecting dolls lost its name to the the "f" word. Words cannot do justice to the awesomeness that is this image. Holy crapola. Thanks for the new desktop. 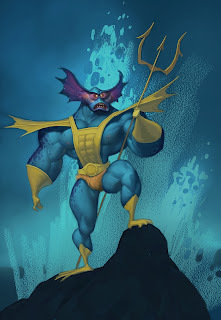 Sweet Mer-Man. He remains a favorite to this day.